Note: this post was written in August 2017 during my trip to Europe. Whenever I mentioned to people that I was visiting Parma, I was most often met with puzzlement and questions asking why I would go there. My answer was always the same: for the food. 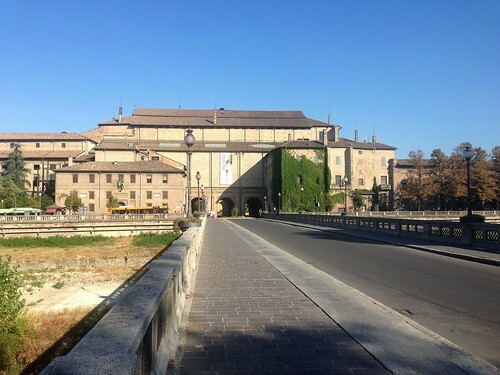 But on my arrival in Parma, I was pleasantly surprised at the visual attractiveness of the city as well. 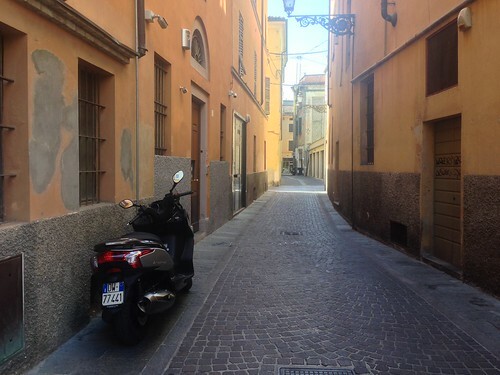 My first walk into Parma’s centre was an unplanned and purely exploratory exercise. I had not done much research on the architecture of Parma as my main reason to travel here was to sample some of the local regional cuisine, which includes some of my favourite ingredients and dishes (e.g. parma ham and risotto). I crossed one of the main bridges over the bone-dry River Parma and right in front of me was the towering Palazzo della Pilotta. This sight of this imposing yet beautiful building took my breath away, which is not something that happens very often. It is difficult to do the place justice with an iPhone camera, but this central area is beautiful. The square that surrounds the Palazzo and its adjacent buildings is large enough to fit into the scale of the 6-7 storey buildings but small enough to cross in a reasonable amount of time. Parma is not a large city – it only has a population of around 190,000. But because of its compact nature, the central area still bustles with activity. There were hardly any non-Italian tourists around and even these regional visitors were small in number. This gave Parma an authentic feeling that parts of Florence and Rome did not have later in my trip. There are no tourist traps, no stalls selling fake jewellery and postcards, and certainly no fake gladiators trying to sell overpriced photographs. The Palazzo della Pilotta does much more than look pretty from the outside. It houses a large art collection that is of very high quality. For five euros (discounts apply for youth, students and other concession classes), you gain access to the Palazzo’s various exhibits. 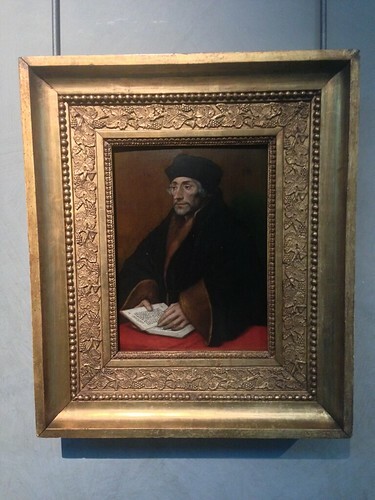 The National Gallery is exceptionally well-stocked with a wide variety of sculptures, paintings and other artwork from a very large timescale. Pieces range from little-known local artists through to works by Correggio and even Leonardo da Vinci. Probably the most memorable part of the experience at the Palazzo is the entrance. Once you buy your ticket, you are shown through an archway with little indication that through this doorway lies a massive theatre. 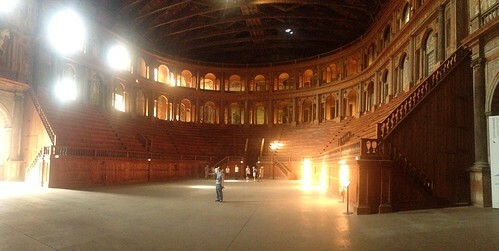 The Teatro Farnese was first constructed in 1618 and extensively reconstructed shortly afterwards. As with the Palazzo itself, the theatre was heavily bombed during World War 2 and rebuilt in 1962 in its plain original 1618 style. 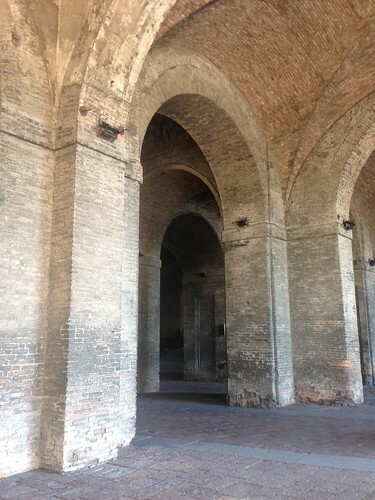 It is a strikingly large building and is still used for performances today. Another surprise in Parma was stumbling upon its main area of green open space, just across the river from the Palazzo della Pilotta. 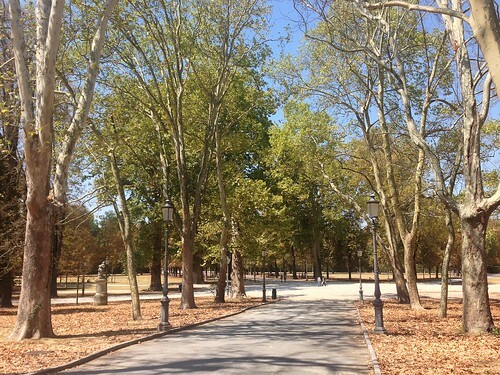 The Parco Ducale is a beautiful and expansive park that is definitely the best one that I have come across in Italy. As I was walking down one of its long paths for the first time, I started hearing a male choir singing verses from an opera. Not quite convinced that I wasn’t going crazy and hearing things, I continued walking, only for the singing to get louder. Turns out that there is a cultural centre next to the park where they keep the windows open while rehearsing. It was very relaxing to sit on a shady bench nearby and enjoy the scenery with this beautiful singing in the background. As mentioned at the beginning of this post, food was the main reason for visiting Parma and did not disappoint. I have written a separate post on food in northern Italy that goes into Parma’s food scene in more detail. It is worth mentioning the ‘ordinary’ buildings of Parma in addition to its monuments and grand public buildings. I thoroughly enjoyed my walks through the inner suburbs of Parma and the city centre. Many of the 3-4 storey buildings are colourful and look very fetching, especially in the low light of sunrise and sunset. There are several ‘main streets’ which have had vehicle traffic mostly restricted. This has created long and winding cobbled streets with cafe chairs, street stalls and other diversions that keep these areas vibrant and interesting. Parma and Bergamo are the two places in Italy to which I would definitely like to return. Compared to Florence and Rome later in my trip, they were both much more pleasant cities to visit in almost every conceivable measure.